A pocket version of the popular online PC game, this app stays true to its roots with its randomly generated worlds, a choice between Survival and Creative mode, and the option of multiplayer. The app also recently updated the pocket edition to with the infamous Creepers, baby animals, new tiles, and many more. The Lite version is free, but the full version is $6.99. The simplicity of this game definitely does not diminish the addictive gameplay. The app has limited modes in the free Lite version, but the full version has three extra game modes: Zen Mode, Game Center Multiplayer, and Arcade mode. What’s better than catapulting hot-tempered fowls to destroy buildings and pigs? Catapulting hot-tempered fowls dressed in iconic Star Wars gear to destroy buildings, pigs, and not to mention, the Death Star on space, of course! The app is $.99 to download in iPod, iPhone, or iPad. 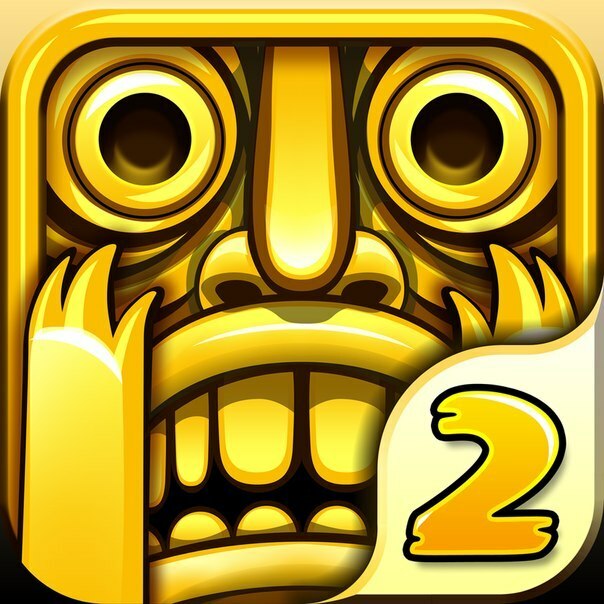 As a sequel, Temple Run 2 is everything Temple Run was, but with better graphics. The new version has also added cliffs, zip lines, mines, and forests to its course, as well as more power-ups and achievements. Unlock your inner adventurer and run! The app is free to download for iPod, iPhone, or iPad. Prepare to garden and hunt zombies—yes, at the same time. With an arsenal of 49 zombie-zapping plants, aim and shoot at the 26 types of zombies before they reach your home in the 50 levels of Adventure mode. Languages available: English, French, German, Italian, and Spanish. The app is $.299 to download in iPod, iPhone, or iPad. Beware: this simple game can be addictive to word game lover. You are given four pictures that have one word in common between them; can you guess the word? Take a new twist on an old-school gem with Retro Pinball. With sound augment Retro Pinball action, the app features ten classic tables: Cyborgirl, Deep Sea, Excalibur, Magic, Pot-of-Gold, Space Journey, Toy Factory, Crash and Burn, Super Android, and Pangea. It’s Fionna Time! The battle never ends when a girl has to fight off evil monsters with the option of four different swords: golden, root, crystal, and demon. Your character will also be able to summon a knife storm or unleash the fury of the vampire king, Marshall Lee. Boasting over 20 million players, Ruzzle is a fast-paced word game where you can challenge friends or random opponents to a word search challenge. The objective is to find as many words as possible on the board. Games are available in various languages: English, Danish, Norwegian, French, German, Dutch, Swedish, Brazilian Portuguese, Spanish, and Italian. With aesthetically appealing visual clues and witty hints, Icon Pop Quiz is a perfect app for every self-claimed pop-culture expert out there. Not to mention, all of the icons are available for download as high-definition wall paper for any iOS devices. Test your problem-solving skills by connecting pipes with matching color and playing to cover the entire board to solve the puzzle. With the option of Free Play or Time Trial, the game stimulates the mind. Complete with animated sound effects and clean graphics, the game currently has 750 free levels and 10 different board size. Praised as Game of the Year by Pocket Gamer and PhoneArena.com, the app combines intelligence and imagination in a physics-based puzzler where players help Swampy the Alligator with his plumbing, making sure to avoid algae, ooze, triggers, and traps. With 250 million downloads around the world, the puzzle game revolves around an adorable little monster and its sugar cravings. Aside from its simple, fun gameplay, the game has also been praised with the Apple Design Award, the Pocket Gamer Award, and several more. Dash and dodge through the beautiful Rio accompanied by vivid and colorful graphics! If that’s not enough, the new update package includes three new boards—including the Daredevil board which allows the character to surf faster—and a new character: the surfing, samba dancer Carmen. Much like its best-selling older sibling The SimsTM 3, the SimsTM FreePlay allows players to create over 16 customized Sims and control their daily life—from furnishing their dream home to making babies, and living happily-ever-after. The only downside is that you will need an Internet connection to play. With a 4.5 star out of 3902 ratings on iTunes, Lazors is a puzzle game of lasers and mirrors. The objective is to hit all the targets by moving the blocks to reflect the lasers towards the wanted direction. The game currently has 120 levels. The beloved cat icon joins the café business, and she needs help. The main objective of the game is to serve food to all of the tables as soon as possible before they walk out dissatisfied. The game has a wide selection of cute Hello Kitty-themed furniture and decors; you can also rearrange the chairs and tables to your liking. Another twist to the old classic, this app rolls out four new features: the one-touch marathon mode, Tetris GALAXY, Tetris LOG, and Tetris RANK. Do not underestimate the colorful graphics of this game. Though it has a fairly easy and fun gameplay, it’s a challenge to master. The new update unpacks 30 new levels and a new challenging blocker called Marmalade. Sweet! It’s simple: just aim and shoot! As a follow up to Clear Vision 1, Clear Vision 2 unpacks many new features, such as 25 new mission, retina display support, animated cut scenes, and many more!